Nick Olson rewarded for leading complex de-merger. 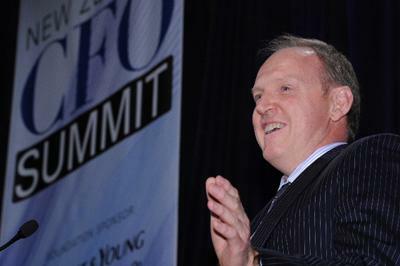 Telecom chief financial officer Nick Olson has won this year's CFO of the Year award. The judges recognised Olson's leadership during the telco's de-merger and the development of its strategic plan. Others awarded at the event, attended by more than 350 people at Auckland's Sky City conference centre, were Martin Gaskell, BNZ's youngest ever divisional CFO and winner of the Young Financial Manager of the Year award. “Martin’s strong technical skills have helped him develop an incredibly committed and high-achieving team. He was also one of 20 people, out of 40,000 employees across New Zealand and Australia, to be selected for the bank’s Accelerate leadership programme,” said the judges. Air New Zealand won the Finance team of the Year prize while Auckland Council took Financial Innovation Project of the Year for its annual plan. Earlier this year, Sir John Buchanan was given the Lifetime Contribution to Finance and Business Award.